The town of Bhimtal is more popularly known fro its lake resort.Bhimtal which comes under the district of Nainitalof Uttarakhand is about 22kms away from this district.The magnificent lake of this town is situated at an altitude of 1371.6 metres above sea level. Being a lake resort Bhimtal entertains the tourists by many water sports and also boat rides. It also takes the merrit of the largest lake in the district of Nainital.It is situated within the range of temple bells, which have been chiming for the last 300 years in the 17th century edifice, beneath the shadow of the towering mountain rushing precipitously down to the emerald green lake. Apart from all this Bhimtal is loaded with peace and greenery which acts as a magnet to pull the tourists. There are number of farm houses along the gardens of citrus shrubs which again pulls the tourist crowd. Bhimtal is located in the northern part of the state of Uttar Pradesh, in the northern region of India. It is located at an altitude of 1,371 m above sea level amongst the Kumaon hills. exile Bhima came to this place and he also built a temple for Lord Shiva popularly referred as the Bhimeshwara Mahadev Temple.Bhimtal used to be the spot for a break journey for the travellers travelling to the other plains or the hills. You can still see the existence of a road connecting to Kumaun,Nepal and Tibet which might have been the part of the famous ancient silk route.Bhimtal was captured by the British after their victory in the Anglo-Nepalese war in 1816. 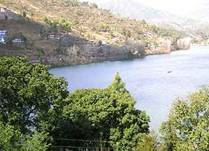 The ideal time to visit Bhimtal is between mid April to mid July or during mid September to October. This is one of the largest lakes in the district of Nainital. The main feature of Bhimtal is that the lake water does not dry up round the year and is known to be a wonderful lake resort to the tourists. 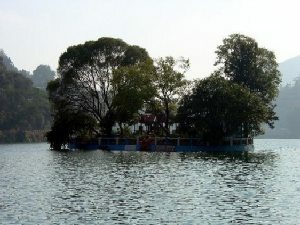 The island at the center of the Bhimtal Lake is another attraction for the tourists. A promising view of the lake from this island makes you feel worthwile in visiting this place.One can also go for trekking in the vicinity. This museum is also popularly referred as Lok Sanskriti Sangrahalaya and has a store of artifacts and information about the hill districts of Uttar Pradesh. The collection includes ancient wooden artifacts, information about traditional rites, rituals, stone implements, and items of archeological importance. It also houses a sizable collection of reproductions and photographs of rock art. The Snow view point is located at a height of 2270 meter above sea level. It can be reached by the ropeway or the ponies available at Mallital. Sat Tal lake is situated at a distance of about 7 Km from Bhimta and it means conglomeration of 7 lakes. The other interests here for the tourists are boating and fishing. Naukuchia Tal got its name for the fact that it has got nine corners and is situated at a distance of about 4kms from Bhimtal.This place is surrounded by greenary and forests and also attracts migratory birds, which makes it a bird watchers paradise. It is also ideal for boating. The origin of the name of this lake is that legends believe King Nala drowned in this lake and hence it is also considered sacred by the people.It is situated at a distance of about 2kms from Bhimtal. About 5 km from Bhimtal is a hill known as Hidimba Parvat. It gets its name from demon Hidimba of Mahabharata. Vankhandi Maharaj, a monk and environmentalist lives on the hill now, and has created a sanctuary for the wild animals around the hill. The area is known as Vankhandi Ashram. This hill is named after the mythical cobra – Karkotaka and also has famous nag temple.The presiding deity of this temple is Nag Karkotaka Maharaj which is visited by a number of devotees on Rishi Panchami. This was originally called as city of 60 lakes and situated in the Kumaon hills at a distance of about 22 kms away from Bhimtal.This hill station is surrounded by mountains on all sides.It is also known for its beautiful lake. 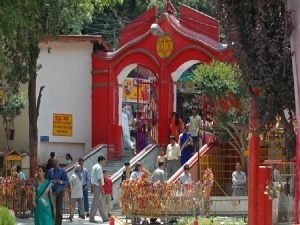 On the northern side of the Naini lake is built a temple dedicated to Sati and is called the Naina Devi temple. Some interesting things to shop for in Bhimtal are hand made candles, wooden handicrafts, organic products and curios. Bhimtal does not have an airport of its own.The nearest airport is at Pant Nagar (55 km). The nearest railway station is at Kathgodam (23 km). Bhimtal is well connected by bus with Nainital and Kathgodam. Tourists can also reach Bhimtal by hiring taxi from Nainital or Kathgodam.